Bonzai! My name is Sayward Rebhal (sey-wurd reb-uhl), and I am a scientist, writer, and urban farmer extraordinaire. When I first built this webspace in early 2009, I called it Bonzai Aphrodite, after a Tom Waits lyric. Back then I was a newlywed, a new vegan, and newly living in Portland Oregon. My husband and I resided in a tall skinny townhouse, where I turned our tiny backyard into a miniature urban food forest. We had rescued hens and a couple of mischievous mutts. I spent my days writing, gardening, crafting, and cooking up kitchen witchery as I explored modern vegan cuisine and traditional prep and preserving techniques. I was on a mission to live as healthfully and eco-consciously as possible. I created Bonzai Aphrodite as a way to share information and inspiration with like-minded folks. And to my delight, an amazing community – a network of action-oriented optimists – grew there. We covered everything from green cleaning to earth-friendly fashion, ethical eating to urban foraging to backyard farming. We examined trends in nutrition and we challenged ourselves to consume less, give more, and live authentically. It was a success! The information and inspiration flowed freely. In March of 2010 my whole world changed when our son, Waits Rebhal, was born. As I adjusted to motherhood, I incorporated “compassionate parenting” into my blogging agenda as well. And in the summer of 2011, I published my first book: Vegan Pregnancy Survival Guide. But after my son was born I was not well, and behind the pretty blogging facade, my life was unraveling. In 2012, on the three-year anniversary of Bonzai Aphrodite, I said goodbye to the space I had worked so hard to build. I took one whole year off from blogging, and you can read about that difficult time, here. A lot has changed since I started this blog. 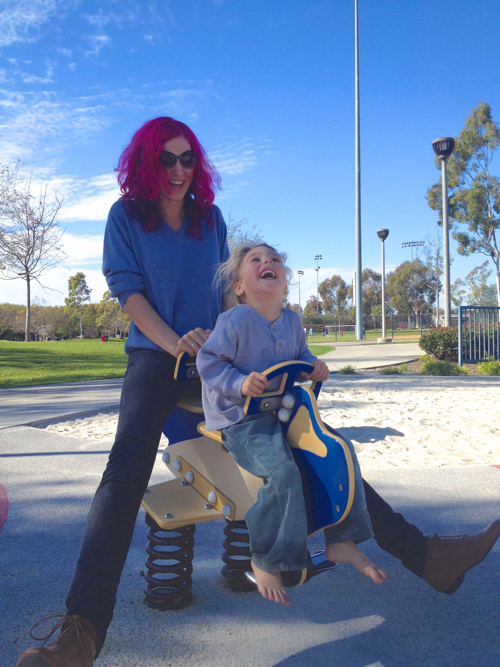 Nowadays I’m back home living in beautiful southern California, separated and share-parenting my son with his amazing and dedicated father – no longer my husband but still my partner on this crazy parenting journey. I work as a freelance writer and certified Vegan Lifestyle Coach, and I’m in graduate school studying evolutionary biology. And I absolutely love my life. It’s incredible to me how much I have changed, and I cherish this blog as a record of my transformation. Here on these pages, I still share my love of vegan food, healthy living, raising compassionate children, and an ever-eco-friendlier lifestyle. I feel so grateful for this growing community, some of whom have been here since the very beginning, and many of whom are just arriving, more and more every day. If you’re new here – WELCOME. Pull up a keyboard, and join the Socially Conscious, Totally Fabulous revolution! Short Bio: Sayward Rebhal is a writer, a mother, a mover, and a maker. After a 5-year stint in Portland Oregon, she hightailed it back to southern California, where she worships the sun on a daily basis. Sayward is currently working towards a Master’s degree in Evolutionary Biology, and is certified as a Vegan Lifestyle Coach. She is the author of Vegan Pregnancy Survival Guide (Herbivore, 2011) and blogs at Bonzai Aphrodite.